Regular readers may recall I struggled a little with 2015’s Motive by Jonathan Kellerman. It felt, I said at the time, a bit like he was going through the motions. Alex and Milo both felt a little stale and I welcomed Kellerman’s The Murderer’s Daughter (released in mid 2015) and felt it offered something fresh and new. Breakdown, Kellerman’s latest, appeared with little fanfare (which makes me wonder if others agree with my thoughts). Indeed I hadn’t realised it was out until my review copy arrived and I noted it’d already been released. Kellerman offers up a slightly different Alex Delaware in this outing; and the plot – thankfully – kept me guessing. Dr. Alex Delaware first meets beautiful and emotionally fragile actress Zelda Chase when called upon to evaluate her five-year-old son. Years later, Alex is unexpectedly reunited with Zelda when she is involuntarily committed after a bizarre psychotic episode. But tragedy strikes and shortly after her release, Zelda is discovered dead in the grounds of a palatial L.A. estate. Having experienced more than enough of the city's dark side to recognise the scent of evil, Alex turns to his friend, LAPD Lieutenant Milo Sturgis, for help in finding the perpetrator. Meanwhile, Alex is caught up in another quest: the search for Zelda's missing son. And when other victims vanish from the same upscale neighborhood, worry turns to terror. As Alex struggles to piece together the brief rise and steep fall of a gorgeous, talented actress, he and Milo unveil shattered dreams, the corruption of a family, and a grotesque betrayal of innocence. With each devastating revelation and damning clue, Alex's brilliant mind is challenged as never before - and his determination grows to see a killer caged and the truth set free. Alex worries he’s let Zelda down and wonders if he should have done more when he first came across the former actress and her son. As a result he’s a little more obsessed than we’ve seen him for a while. To the point Milo has to reel him in on a couple of occasions. Because the characters had become a little beige for me – shadows of their once charismatic selves – I was actually glad to see something a little different from the psychologist. The plot at hand is mostly an interesting one. I did (initially) feel it was a bit of a leap to tie some other disappearances to Zelda’s death. Kellerman also introduces a few threads, which all tie up in a fairly surprising way at the end. But I was kept guessing and keen to understand Zelda’s fate so was pulled into the unfolding story. I’m hoping Kellerman keeps throwing a few curve balls at his lead characters as this was an improvement on its predecessor and an enjoyable read. 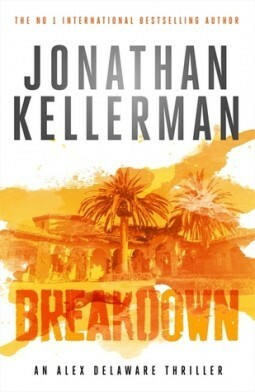 Breakdown by Jonathan Kellerman was published in Australia via Hachette. Good to hear that the story is decent. I’d lost a bit of faith in JK’s writing and wasn’t that interested in reading him again but this sounds like redemption. This felt a bit different Char. Milo was kinda helping Alex out as he was at a loose end. Robin wasn’t around much (yay!) and Alex seemed a tad obsessive! I’ve been reading Kellerman since a year past his first mainstream fiction release way back when, and there has been binge reading, and then years of neglect. I haven’t read the last 3 or so new releases, but in my humble opinion he should lay this series to rest and leave Delaware and Milo off on a high note. I just can’t garner much interest for him anymore, though he used to be an auto-buy author. I’m exactly the same Rita. I really struggled with the book before this and even this… Milo was kinda at a loose end and starting by just helping out. But… I enjoyed The Murderer’s Daughter and hope he continues with that as a series… something new and fresh! I haven’t read any of Kellermans books but I do like a good crime novel but JD Robb spoils the others for me! Thanks for sharing. True… the In Death series is fabulous isn’t it!? This book was a snoozefest from the opening sentence… noise was everywhere. Very little suspense and not enough compelling character development. In any good murder mystery you want to really hate the perpetrators. In this book simply calling them monsters doesn’t do it. At the end, there was no overwhelming sense of relief and gratification when they finally cuaght theor man and/or woman. Definitely the worst JK novel I’ve read. I think I struggled more with his previous novel. They started to improve again a little (for me) with this one.